EDIT: This thread is a work in progress. Please contribute your two cents so we can figure this all out together. I've noticed more and more people are having issues with mysterious problems popping up on their ponies recently. And I, for one, am totally confused by it all. I know there are others who are as well. I have ponies with mold issues, ponies with cancer issues, and ponies with regrind issues. My idea here is to keep this post updated regularly with pictures and examples of all kinds of unstoppable pony problems. That way it is clear, and everyone can easily identify what their pony issue is and see what can (or can't) be done about it. I think it would also be good to list who is more prone to these types of issues, and what can be done to prevent the spread of these issues as well. If you have clear pictures, or can explain these problems in a concise way, post them here and I will update this first post. Or, if you have questions yourself, post them, and maybe we can all help each other get them answered. 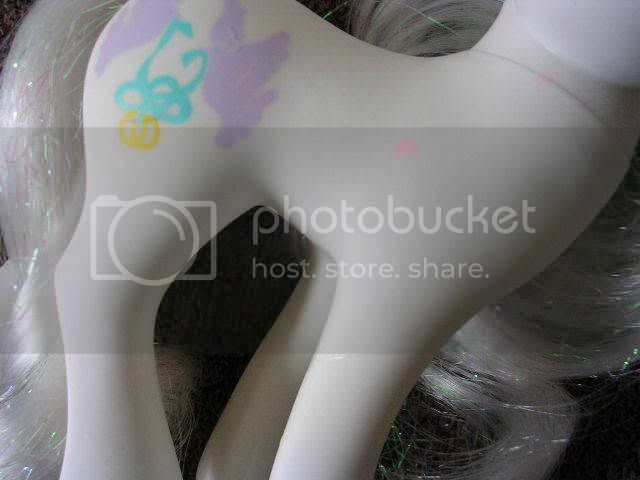 Here are some starter example pictures of a few ponies I have with issues. Please correct me if I'm wrong. What is the difference between cancer and age spots? What is the difference between cancer and mold? 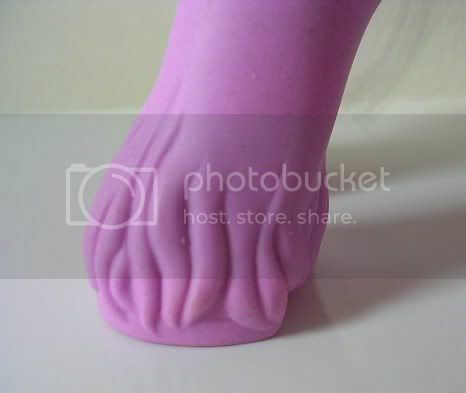 How many types of pony mold are there? What can be done to prevent regrind? Can cancer spots be removed or lightened? Can regrind be removed or lightened? 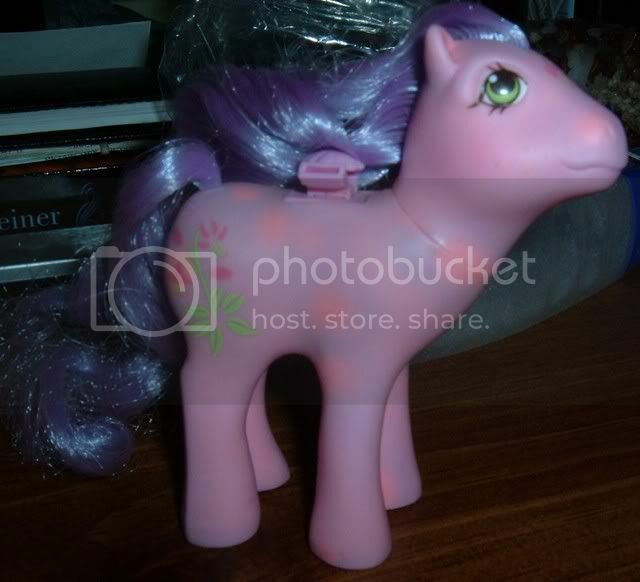 Will cancer spread to other my other ponies? 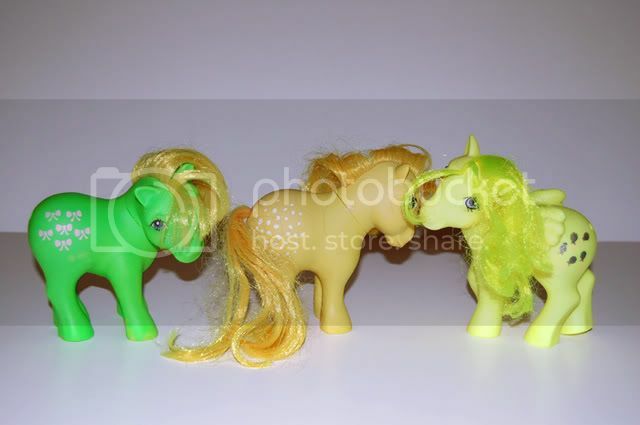 Will mold spread to my other ponies? Is the mold harmful to me, my pets, or children? In which case would it be best to boil a pony? Do I use any chemicals or cleaning aids while boiling? In which case would it be best to clean a pony using diluted bleach? How much bleach? Should the water be warm or cool? Will it harm my pony's color or hair? 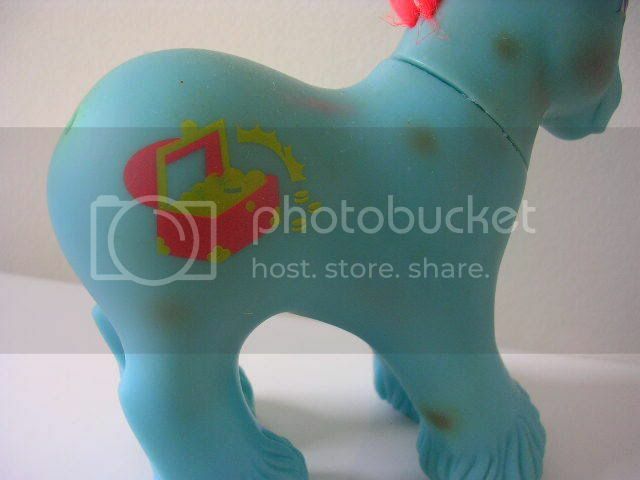 Can ponies with glitter symbols that have cancer or mold be boiled? Can they be bleached? 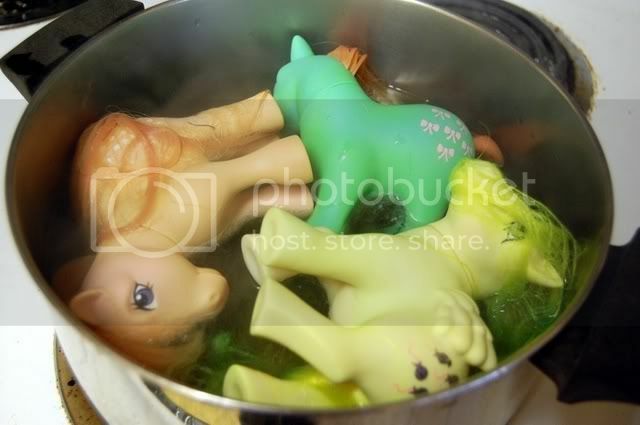 Can twinkle-eyed ponies be boiled? Can they be bleached? What can be done about a So Soft pony with mold? What is pin dot mold? What is the difference between ingrained dirt and pin dot mold? What can I do about a G3 pony with mold issues? Thanks to everyone who has donated pictures and information! 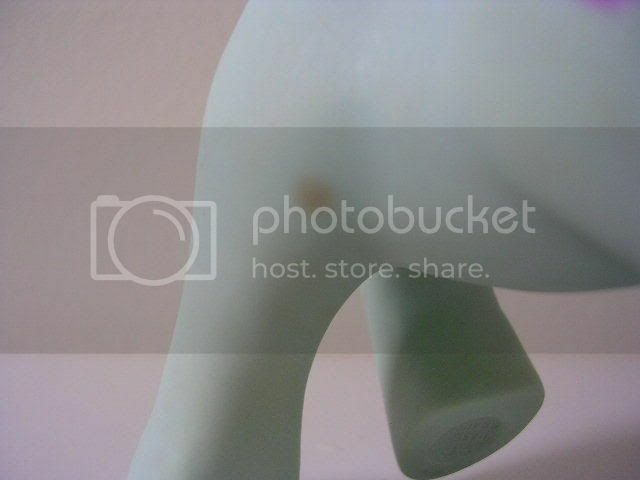 Here is an example of the dreaded Pin dot mold. You can clearly see the darkness on her ear, in reality it's tiny tiny dots of mold - beware! Nina85, I don't think your first pic shows regrind, that is most likely some sort of pink marker. What I don't understand, is what is the difference between the dot (cancer) and the dot with the tiny dot inside (mold)? I have updated the first post with pictures and questions. Thanks everyone. Gonatcha - I am pretty sure the pink markings on the left and right side are regrind. The darker mark in the middle may be an actual pen mark of some kind. Here is a picture of a different Pony Bride. You can see the beginnings of regrind below the neck seam and on her side. It is the same color as the regrind on the other Pony Bride. 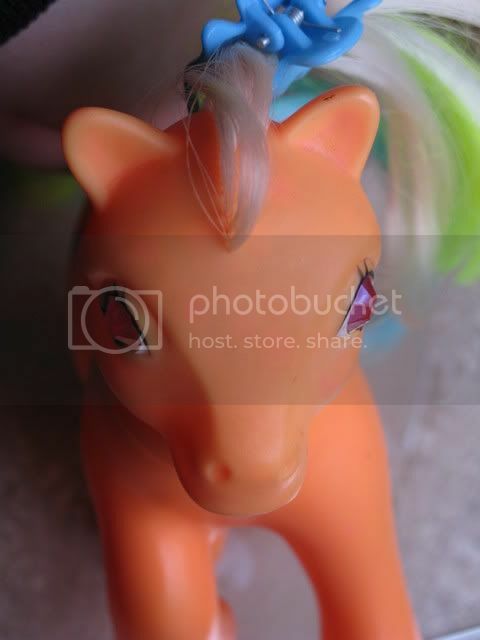 Pony Mold is actual mold spores which have grown inside the body or plastic of the pony. It happens primarily to ponies which have been exposed to water and have not been properly and thoroughly dried afterwards. Ponies in humid areas are even more prone to mold growth. 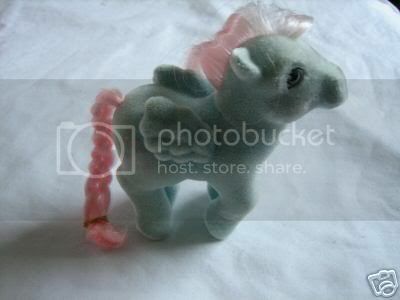 Pony Cancer is the deterioration of a pony's plastic over time. As the pony gets older it's plastic can literally begin to "break down" internally, causing visible spots on the pony's body. There is no way to stop Pony Cancer, but the spots can be lightened by letting the pony sit in direct sunlight for a few weeks. While regrind and cancer are not contagious from one pony to another, mold can be. 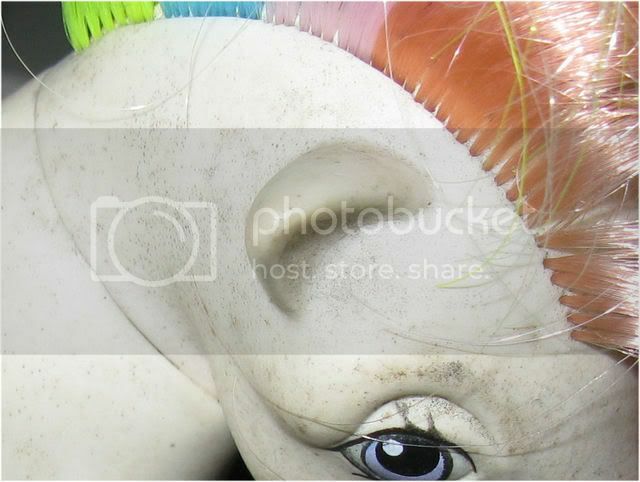 Ponies with mold should be bolded, given a diluted bleach bath, and scrubbed immediately. I'm not sure if this mold is harmful for people...I'd like to know that myself. Awesome thread, by-the-way, Nina. This was much needed. Thank you Sweetcakes! That was really helpful info you gave. I will add it to the original post when I get home from work tonight. Those pictures of regrind, dont look it to me. They look more like high lighter marks than anything. I could be wrong though but I've never seen a white pony with regrind. I just tried to take some pics of my regrinded party time..
GG Luke: "It tasted pink. I mean like really tasted really pink. Like pink, pink! God that�s terrible! It�s like drinking a My Little Pony!" The picture in the first post about regrind isn't really regrind. For me it just looks like marker that got stuck permament into the body. (And could be easily removed with letting those ares sitting in the sun). I tried both methods with my whole lot of TE's and here's what happened. Boiling -some of the glaze appeared to have been worn away a bit, looks like it was from when the eyes rubbed on the pot as I was stirring. They didn't have full glaze in the first place, so i can't be sure how much was affected. 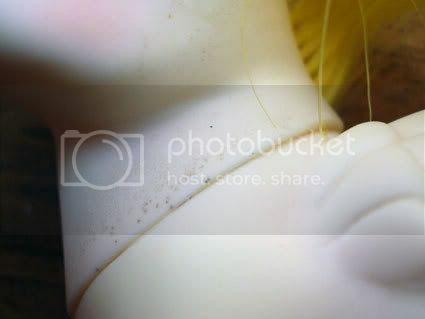 Bleaching -I left the heads of two different ponies in for maybe 3-5 minutes each in a combo of less than 1 part bleach with two parts water (less than 1/3 was bleach) and one of the four eyes that went in and came out had the glaze turned a very light blue and not see through at all. This was my dear sweet Gingerbread too. Right now that's a 1 in 4 'no' for bleach and an 'all clear' for the boiling if they're already got a bit of wear to their glaze. I personally will only boil TE heads from now on and I'll also only scrub them with bleach, not soak them. Although, I'll be mroe careful when I do boil. 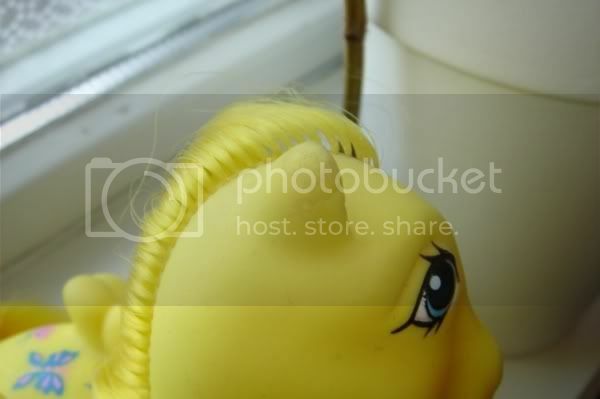 Also, does anyone know about the wing holders on flutters, would those melt in boiling? I don't think so, but I'd like to know if this has happened to anyone. I don't think that you can truly differentiate between "Age Spots" and "Pony Cancer." I think in most cases they're just different words for the same thing. 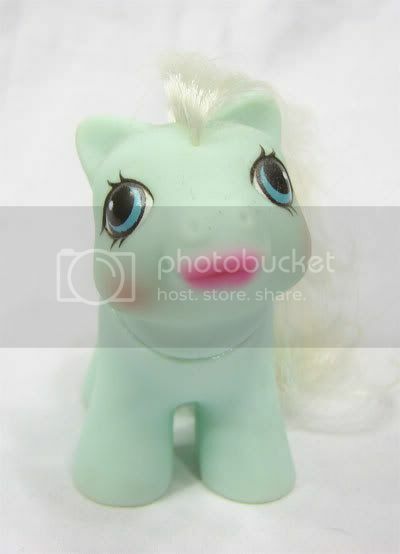 Pink highlighter on light colored ponies are probably accessory stains or makeup stains. 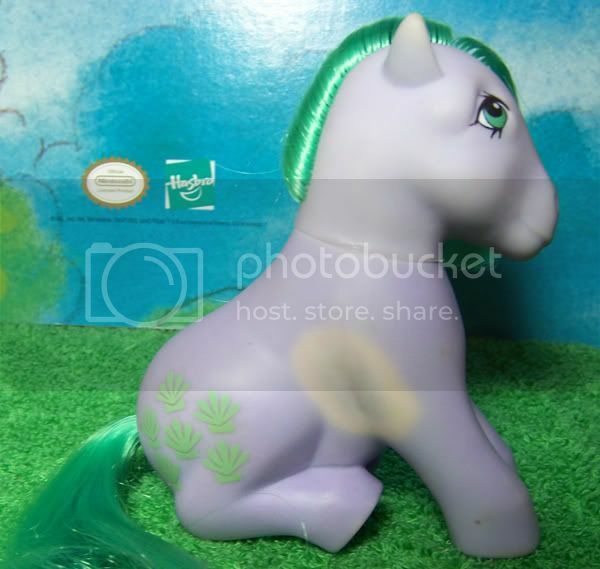 I don't think pink marks on light colored ponies are the same as regrind. The reason that regrind is pink so much of the time is that the other colors in the dye have faded away. It's sort of like paint mixing--- blue and pink makes purple and yellow and pink makes orange. If you remove the blue and yellow you're left with pink in either case. Regrind is caused by dyes fading unevenly in batches of reground plastic. When you see pink marks on a Partytime, it's not because the plastic turned pink, it's because it became less yellow. 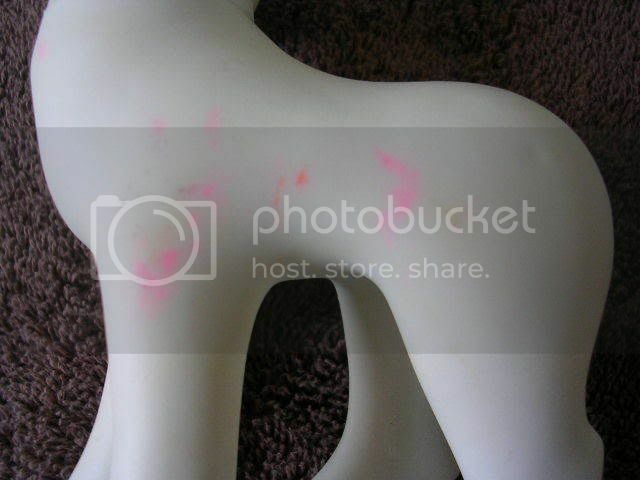 I've washed lipstick off ponies, and it leaves marks that look just like pink highlighter. My cancer guide is almost done. I'm sorry that it's a few days late!